I bought it today....got the title. Will do the title transfer and get plates for it on Tuesday when the local DMV is open next. Then get a ride back to the guy's house and ride it home. I swear this thing looks like someone went back in a time machine to get it. 7,019 miles on it. It's a 1990 that he bought new in 1993. I bought these Cortech soft bags for it...they're not attached, I just laid them over the seat to see what they'll look like. I think they look great on the bike. This thing is gorgeous! That is one very clean looking CBR1000F! Well done, and such low mileage too. To tell you how **** this guy was, the original owners manual got a little wet/faded, so be bought a new one. It has brand new Michelin Pilot tires on it (2 years old, he said 30 miles on them). Also new brakes (no idea why...he said he just replaced stuff after a period of time - very meticulous), new chain, battery (today) and a tune up 4 years ago. I think he's only selling it because he dropped it around the corner right by his house and scratched the exhaust, right mirror, and fairing a bit. I'm not overly worried about that though. 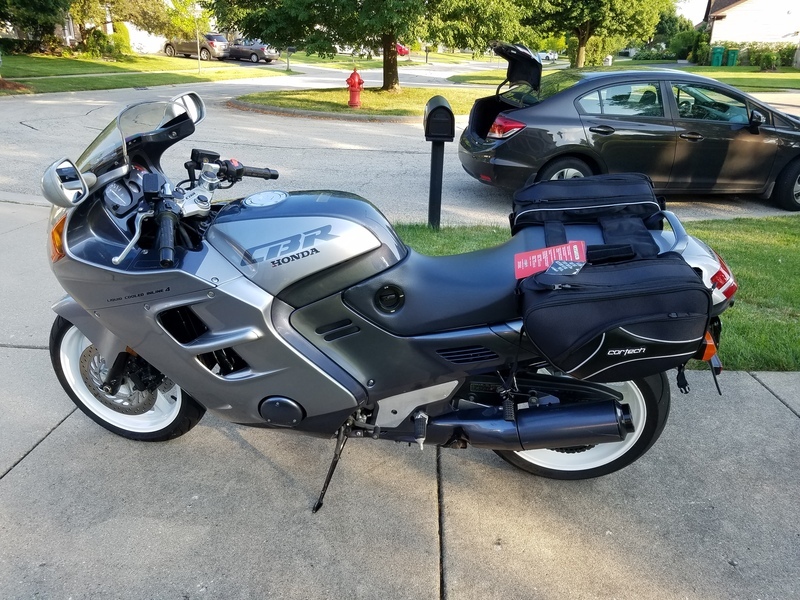 I bought it to ride it, and with 7k miles on it, it should be good for a while. Other than the scratches, when you look at this bike, you could literally put it on a showroom floor and people would believe it's new. Last edited by Webbie1; 06-26-2016 at 10:45 AM. It's beautiful. I wish you many happy and safe years of enjoyment on it! Yup. In Chicago. NW Side. Bought a 95 F3 today.